Church Without Walls WF meets at 4:00 pm the last Sunday of every month at the Farmer’s Market in Wichita Falls, Texas. The next meeting is Sunday, April 28, 2019.
Who are we? 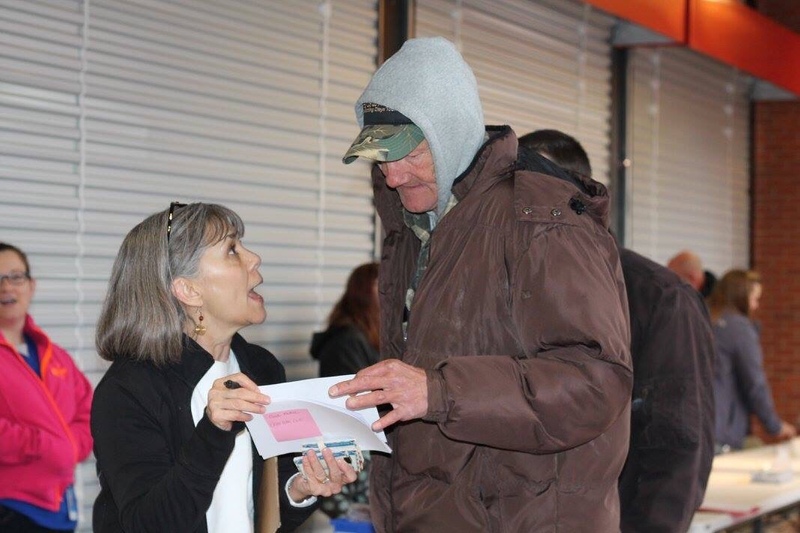 We are a group of people from different backgrounds and churches, but the most important thing about us is our PASSION for the underserved, poor and homeless of Wichita Falls. We offer a once a month church service for our friends. This is their church. They are welcomed and loved during our service. We have a worship time with music, a teaching time (spiritual food) and a meal (physical food). We are out on the streets during the time we don’t have church checking on the welfare of our friends. Every little bit helps. A meal prepared and served by volunteers is provided before each service. We collect coats, socks, gloves, blankets, clothing, toiletries, and whatever we can to meet the overwhelming needs of the homeless in our community. Go to the Volunteer page to see what donations are needed in the near future. If you want to make a cash donation, click the pay button below. Thank you for choosing to donate to Church Without Walls Wichita Falls. We provide assistance with rent, deposits on rentals, bus passes (local and one-way). We also provide assistance with emergency shelter and goods. We can help with utilities. We are here to be the hands and feet of Jesus. What happens to pets when a person is homeless? What happens to a pet when someone is homeless? Well, first of all, more often than not, their pet is all that they have. Many of the homeless shelters are not capable of taking in dogs… and for good reasons-many don’t have their vaccinations up to date, people who are in the shelters may have allergies to dogs and some are afraid of dogs. We have been blessed with a rescue group that helps us with these situations. When I know of families that have pets, I contact the rescue group, and the dogs are placed in a kennel at an undisclosed location, and if the dogs are smaller, the group has people that will keep the dog until the owner has a place to stay. Being homeless not only affects the families, it affects the pets as well. Just wanted to post this. It is on my heart. Posted on June 11, 2018 June 11, 2018 Author cwwrocksCategories UncategorizedLeave a comment on What happens to pets when a person is homeless? When helping the less fortunate, there are resources that are available. Many people think that they have to “shoulder the burden” to help those who are in need. Having worked with the less fortunate for more than 20 years, I can say that I finally have a list of resources; however, I hope that the list continues to grow. I really wish that all of the churches, homeless shelter and other organizations could come together and help….it would be incredible. It seems like everybody is doing their own thing, and then the people that we are helping take advantage and go from church to shelters and other organizations to get help, and then some of the people that we are helping, are selling what was given to them on the street. I wish in a perfect world, we could all work together…with all the resources that are available. Just a thought…. Just because we only meet once a month doesn’t mean that we are not aware of the needs of our friends. Just in the past two weeks we have helped a woman who was recently released from prison with clothes because women don’t have a wardrobe when they come out of prison. Another one of our friends who lives under a bridge was in need of undergarments and clothes, and we helped her get clothing. There was a family of five living in a van, and we were contacted (yay) to see what we could do to help them. We filled their van up, encouraged them to fill out housing pre-application forms, so that hopefully they will have housing hopefully by the end of this week. Another couple that moved to Wichita Falls heard about Church Without Walls, and we got to visit with them, and we will help them get their water turned on. There are needs every day that we get to help the people with and encourage and try to empower them. Tomorrow I will be taking one of our friends, that was on the street for many years, but now is at an assisted living facility, to look at dogs because his doctor said he needed one for his anxiety. How cool is that? I get to take him and help him choose a dog!!!! I am so blessed to be able to do this, and I love it. Thank you for reading this! May you have an incredible, God-filled day!